Most of the anime community agrees that there is one studio that casts a large shadow over all the others. For the last three decades, Studio Ghibli has given us some of the greatest animated films of all time. In 2014, the great Hayao Miyazaki announced his retirement, which meant changes for the studio. Among those changes were the departure of director Hiromasa Yonebayashi and lead film producer Yoshiaki Nishimura. A year later, Nishimura founded Studio Ponoc, and along with Yonebayashi began production on Mary and the Witch’s Flower. The result is a movie that retains many of the elements one would find in a Studio Ghibli film. The execution of these elements, however, is an entirely different story. Mary and the Witch’s Flower follows the story of Mary Smith. One day, while chasing her cat, Mary discovers a weird glowing plant called a fly-by-night. After finding a broomstick in the forest, the fly-by-night bursts, releasing its magical powers. The broomstick comes to life and Mary now has the ability to ride it like a witch. She rides the broomstick to a completely different world where witches and magic exist. Once she arrives, she is immediately guided to a school for aspiring witches, where she learns a lot more about the world and the people who inhabit it. 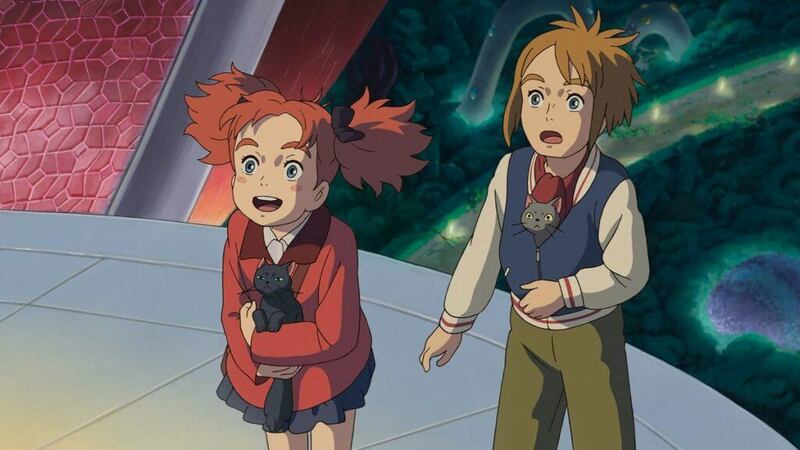 Everything about the story of Mary and the Witch’s Flower screams classic Studio Ghibli to me. Having a plot revolve around a young girl that gets into some fantastic situation is a formula that helped Ghibli reach the heights it has. The problem here is that the screenplay is incredibly dull. It lacks that genuine sense of adventure that it desperately attempts to capture. The first act of Mary and the Witch’s Flower is a complete drag, with very few plot points introduced that help give the story more depth later on in the film. Once we actually get to this other world, it’s hard to get invested in the situation. It was difficult for me to think of this moment as a big deal when Mary didn’t think it was one either. She gets there and is completely okay with everything going on. She takes direction from this weird creature and eventually decides she wants to enroll in witch school. It’s an odd progression for a girl that moments ago found out she had the ability to fly on a broomstick. There’s also this bizarre moment when the movie feels slow and rushed at the same time. So much of the second act is dedicated to the school that the actual conflict doesn’t get nearly enough explanation. This botched set-up hurts what is a much better third act. There is a message in the story of Mary and the Witch’s Flower that I do think is very important, even if it isn’t emphasized as much as I would’ve hoped. We find out early in the film that Mary doesn’t like her red hair. She’s teased about it often, and that causes her to resent it. When she’s in the other world, everyone loves that she has red hair. It’s confusing to her at first, but she accepts it as a compliment. Mary learning to love herself more through this experience is something children who watch the film hopefully pick up on. 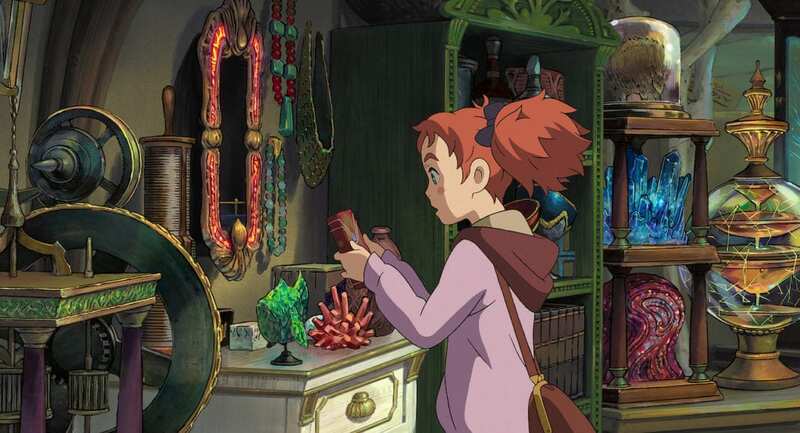 The voice acting is also a contributing factor to how dull Mary and the Witch’s Flower feels. I can understand the decision to go with an all British cast because that’s where the movie takes place, but the quality of the dub is closer to something you would see in the mid-90s. This is especially true for Ruby Barnhill’s portrayal of Mary. I first saw Ruby Barnhill as the lead girl in The BFG and thought she did great. I just don’t think her talents translate well to voice acting. While it’s nice to have a young girl portrayed by an actress who’s actually still a child, her delivery is all over the place and the timing is consistently off. The supporting actors, especially Kate Winslet, do an excellent job, though. Winslet has plenty of experience in voice acting, and it shows here. She plays the headmistress of the school and steals every scene she’s in. I honestly wish there was more of her. The animation is really where Mary and the Witch’s Flower shines. It’s clear from the first scene that the quality of animation is top notch, and some of the imagery presented is nothing short of breathtaking. This is also where the movie feels most like a Ghibli film. There are certain abstract images that reminded me of Spirited Away. We get scenes where animals change form, and it floored me how seamless those transitions are. The colors are so vibrant that every image jumps off the screen. The music works as a fantastic compliment to the animation. Composer Takatsugu Muramatsu brilliantly blends so many different tones and makes these visual moments mean so much more. The string arrangements are the clear stand out for me. They’re prominent in certain tracks, and they’re absolutely mesmerizing. Mary and the Witch’s Flower doesn’t reach the heights I hoped it would. Everything about this film is a clear love letter to Studio Ghibli’s legacy, but it fails to achieve that same level of excellence. The pacing is uneven, and the screenplay, in general, is dull. There are a lot of wasted moments that could’ve been used to further flesh out the world or the characters. The second half of the movie is a lot better than the first half, though. If you can get by the clunky set-up, you’re going to be rewarded. The third act is a frantic sprint to the finish filled to the brim with visual excellence. Mary and the Witch’s Flower is an okay movie that should’ve been great. There are just so many nagging issues that kept me from enjoying the story as much as I wanted to. I still recommend this to fans of amazing animation. The spectacle of this movie alone is worth your time. Mary and the Witch's Flower is a slow paced film that underachieves on almost every front. The saving grace is the fantastic animation that makes its dull story worth the watch. Jorge Luque is a writer and critic from Bronx, NY. As a contributing writer for Geeks + Gamers he provides his unique perspective on anime and film. What Are the Most Iconic 90s Anime?